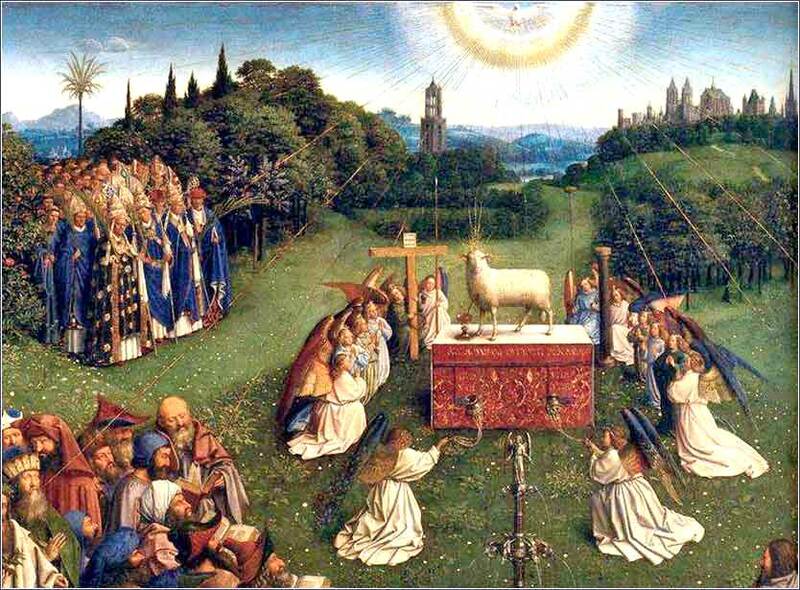 Adoration of the Lamb (detail), from the Ghent Altarpiece by Jan van Eyck, ca. 1432. Lord God, let me not put my trust in the words of men, for their minds are weak and their tongues are tainted by the world; but let me test everything having to do with faith against our only true teacher, Jesus Christ, and the true Word of God that was inspired through the Holy Spirit. 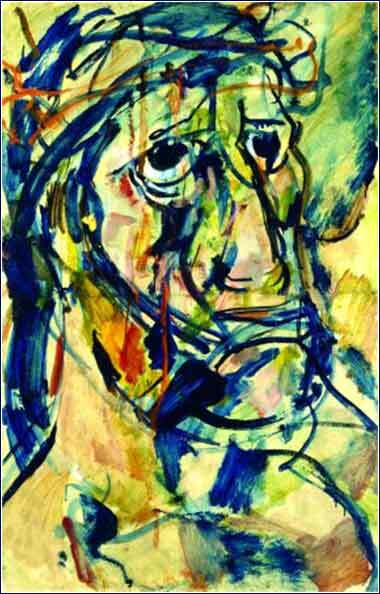 Head of Christ Mocked by Georges Roualt, ca. 1905. 19-21, 26 You know perfectly well what I mean when I speak of indulging the “desires of the flesh”: things like . . . hostilities . . . . As I have told you before, those who indulge the desires of the flesh will never inherit God’s kingdom. 22-24 The Spirit, on the other hand, produces fruit: love . . . .
21 envy, drunkenness, carousing, and similar things, which I warn you about now just as I warned you before: those practicing such acts will not inherit the Kingdom of God. 22 But the fruit of the Spirit is love . . . . The word for today is hatred, but we must be very careful not to limit it to its extreme form. The Greek word used, and Paul’s clear intention, is to include all sorts of hostility and enmity. We can see Paul’s meaning by comparison with verse 22. The first-named “fruit of the Spirit” in Galatians is love. Enmity exists where we do not have the absolute love that Christ had. How hard is this to understand? Very, very simple. There is no caveat anywhere in the New Testament. There is no exception. There is no “wiggle room.” But how hard is it to follow? Possibly the hardest of all Christ’s teachings, because it is the place where we are most likely to rationalize our sin or even deny it completely. Are conservative Christians hostile to people who argue — often in very ugly terminology — for homosexual marriage and who, in the process, call those who oppose them intolerant, hate-filled, etc.? My experience is that, yes, they often or even generally are angry and hostile. It is really difficult to love someone who is calling you a bigot. Are liberal Christians hostile to those who point out that the Bible condemns homosexual behavior, time and time again? Very often they are. In one church I attend, which would fall pretty hard on the “conservative” side, hatred of the Muslim world is sometimes completely undisguised. I have heard people who teach the Bible say that they wish that Arab countries could simply be “nuked” and put out of existence.